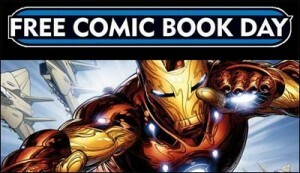 On Saturday May 4th, comic book stores across North America will be giving out free comic books to anyone who steps into their store. Since 2002, the comic book community has got to take part in this event the first week of May and each year seems to get bigger and better. 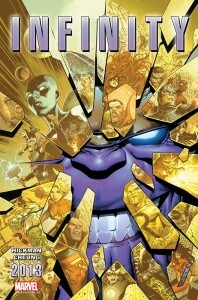 This year we will have a chance to get our hands on Marvel’s prelude to their big summer event book Infinity written by Jonathon Hickman with art by Jim Cheung. Geoff Johns will also collaborate with Richard Donner and Adam Kubert to write Superman (being promoted as a good jumping on point). Brian Wood is writing a Star Wars book and Robert Kirkman is releasing an untold tale for the Walking Dead. There are also 48 other books to choose from. With 52 books to choose from there should be something you like. And many shops will be doing all types of events from costume contests, bringing in local and/or well known writers or artists to sign and sketch. You’ll likely see some discounted graphic novels and trades and perhaps some store themed items that you won’t be able to get elsewhere. My comic book shop Carol and John’s here in Cleveland, Ohio will be bringing in a handful of local artist to do sketch covers, an RD-D2 Badge (May the 4th Be With You) while making available their F.C.B. D Ale. Gail Simone (Birds of Prey, Sinister Six, Batgirl) posted on her facebook a reminder to people that I’d like to share. These books are free to the public. Anyone can come in and grab up to x number of books depending on your store. You’re not expected to buy anything. 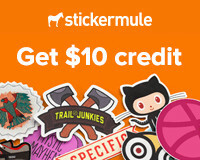 You can literally walk in (or stand in line if you’re not working, which I will be…grrr) take your books and leave. But these shops pay for those books. Gail suggested that everyone take a second to look around their shop and buy something. 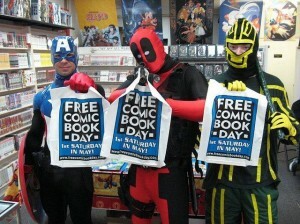 This offended a few as it sort of takes a stab at the whole Free part of comic book day. I’m with Gail on this though. Walk around the shop. If you see something that catches your eye go for it. However, I think there’s something a little more in line with what Free Comic Book Day should really be about other than handing out free books in an age where books cost between $3-$4. 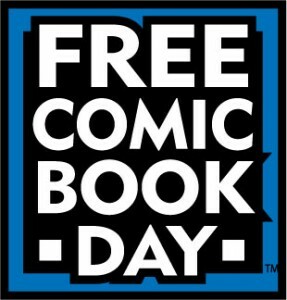 The goals of Free Comic Book Day are to get current comic readers to get a copy of a book they might not have tried otherwise, get old readers to come back into the fray and see what’s going on in the books they put down and most importantly, bring in new readers. I suggest if you’re an avid reader bring a friend. Bring your wife. Bring your husband. Bring your boyfriend or girlfriend. Bring your son or daughter, nephew or niece. If they’re not reading already, introduce them to the comic book medium on May 4th. This is the best way to thank your local comic book shop for their efforts. Bring them possible new readers. A lot of us at one point were kids being taken to these places by parents or grandparents. 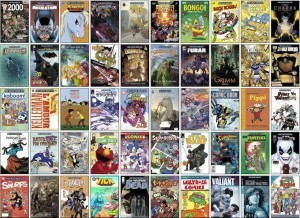 So on May 4th celebrate FCBD by sharing it with someone you like to hang out with or love for one reason or another. Maybe they’ll find something they like. Your local shop gets a new reader. And you get someone else to share your love of comic books with.